has been uploaded. Please read it. 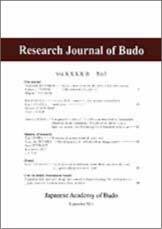 For participants who are making an oral presentation or poster presentation at the Japanese Academy of Budo 50th Anniversary Conference (2017 International Budo Conference), please submit a manuscript for publication in the Proceedings in the manner described below (Submission deadline: Friday September 29, 2017 (Japan time)). We are very sorry, but the Academy is not able to offer assistance in finding accommodation during the Japanese Academy of Budo 50th Anniversary Conference (2017 International Budo Conference). Therefore, we kindly request that all participants make their own arrangements for accommodation as quickly as possible. A publicity poster of the 50th Memorial Conference of the Japanese Academy of Budo (2nd International Budo Congress) has just completed. 1.Please make the presentation application first. Abstracts can be registered from May 20, 2017. 2.An account is needed to make a submission. If you do not have an account, please register by clicking on the “Create an account” link first. After registering for an account, please login to make your presentation application. ・Document title, presentation format, presentation field, names of all researchers and their affiliations. 4.A confirmation email will be sent to the registered email address. If you have not received a confirmation email after one day, please contact the Japanese Academy of Budo System Representatives. * Registrations can be made during the application period. * If you have any queries, please contact the Japanese Academy of Budo System Representatives. ・Presentation Abstract Preparation Period: 09:00 Saturday May 20, 2017, to 23:59 Tuesday June 20, 2017. 1. First, from the “Abstract Template” link below, download the designated style instructions. Please follow them to create a presentation summary. Please ensure that the font in the submitted abstract PDF is embedded. * If the font is not embedded, it is possible that the text may later become corrupted. Thank you for your understanding. 2. At the link, please enter your ID and password to login in order to make your presentation application. 3. After logging in and carefully reading the important information, click “□I agree” , and then click “final submission” in order to register your abstract. 4. A confirmation email will be sent to the registered email address. If you have not received a confirmation email after one day, please contact the Japanese Academy of Budo System Representatives. 5. During the abstract registration period (09:00 Saturday May 20, 2017, to 23:59 Tuesday June 20, 2017), the resubmission of your presentation summary and amendments to the contents of the subject registration is possible from the registration top page. The event details for the 2nd International Budo Conference　(Japanese Academy of Budo 50th Anniversary Conference) was approved at the AGM for the Japanese Academy of Budo at Kogakkan University on 7th September. The registration period to present will be from April 1st - May 10th, 2017. Abstracts must be registered from May 20th - June 20th, 2017. We have 4 presentation sessions (Social Sciences and Humanities, Natural Sciences, Budo Instruction, and International) and a Poster Session. The presenters of the International and Poster Sessions must present in English. The presenters of all sessions must submit an abstract in English. ※　Schedule is subject to modification. ※ For information on how to register, please keep an eye on the Japanese Academy of Budo’s website. In commemoration of the Japanese Academy of Budo’s 50th Anniversary, it is our pleasure to announce that the 2nd International Budo Conference (Japanese Academy of Budo 50th Anniversary Conference) will be held from September 6 (Wed.) to September 8 (Fri.) 2017, at Kansai University’s Senriyama Campus located in Osaka, Japan. Details of the schedule and registration procedures will be posted on this website in the near future. 1. Presentation format: Oral Presentation - 12mins. ; Q&A - 3mins. To make an application to present at the conference, please send the following information to the email address below. �@The application period is from Thursday May 1 to Tuesday May 20, 2014. Please be aware that applications from members who have not paid their fees, as well as from those whose details are incomplete, will not be accepted. Furthermore, once an application has been made, changes to the presentation title cannot be made. �APlease register abstracts from Sunday June 1 to Monday June 30, 2014. �BApplication is limited to presenters and collaborative researchers who have paid their membership fees for the 2014 academic year. If collaborative researchers are not members, please ensure that they enroll in the Academy. You are cordially invited to attend a welcome party that will be held on Tuesday September 9 from 6pm at the Fukuyama New Castle Hotel (Tel. 084-922-2121), a one-minute walk from the south exit of Fukuyama Station. The cost for attending the party is 5,000yen. In order to facilitate the editing and printing work, please send a word processing file, such as MS-Word, rather than a pdf file. Please note that any text for the proceedings will be edited by the editorial and planning committee of the Japanese Academy of Budo to conform with our established editorial conventions. 2. Participants will be given a name badge which they should wear for the duration of the conference. Participants who do not wear a name badge may be refused admission to the presentations. * Participants from overseas : At reception please register, and pay the entrance fee of 5000 yen (3000 yen for students), and take a name badge and research presentation abstracts. 3. Participants who have not yet paid their membership fee for 2013 are requested to pay together with the conference fee. 4. For temporary members: At reception please register as a temporary member, and pay the entrance fee of 5000 yen (3000 yen for students), and take a name badge and research presentation abstracts. With the exception of attendance at the general meeting, temporary members will receive the same treatment as a full member. 5. Members are requested to bring their research presentation abstracts. Programs will not be distributed. 6. The dining hall will be open for the duration of the conference. ☆The program has been uploaded to the Japanese Academy of Budo homepage. For those that are presenting at the conference, please check the date and time of your presentation. The oral presentations are 12 minutes with a 3-minute Q&A session. The poster sessions have a Q&A session if the need arises. 2. Presenters that have materials to be handed out, please hand them to the reception at the appropriate presentation venue. - If using data like a PowerPoint presentation, please bring your own computer. * If using a Macintosh computer, a conversion connector is necessary. * Please also bring a VGA adaptor and a power adaptor. * Please follow the instructions given by the chairperson. * The presentation time is 12 minutes followed by a 3 minute Q&A session (15minutes in total). 1. Two minutes before the end of the presentation. 2. To signal the end of the presentation and start of the Q&A session. 3. To signal the end of the Q&A session. * Please complete registration at the appropriate venue before 09:00, and post on the designated notice board. 5. Changes to the presenter cannot be made. However, in the case of illness or other unavoidable circumstances, please contact the Japanese Academy of Budo immediately and follow instructions. 1. For the presentation session that you are supervising, please report to the presentation venue reception no later than 30 minutes before the start. 2. During the question and answer session, please instruct questioners to state their name and affiliation, and to keep their questions brief. 3. Please keep the session on time. 1. For participants who are presenting in the International Session or the Poster Session, please submit an English manuscript for publication in the proceedings. The deadline is September 12, 2013. 2. Participants who are presenting in Japanese can submit an English manuscript for publication in the proceedings. The deadline is September 30, 2013. 3. Submissions are all online, whether domestic or international. 4. If writing in English, please write approximately 900 words (two A4 pages). Please see the “Proceedings Submission Guidelines” below. 5. If including charts, diagrams or illustrations, use no more than three. Adjust the word count so that the document is no more than two A4 pages. 6. The template for writing documents to be included in the Proceedings will be available around August 21, 2013, on the Japanese Academy of Budo homepage. Please use that template. 7. The editorial and planning committees of the Japanese Academy of Budo will check that the documents submitted for inclusion in the Proceedings meet the requirements for publication. Writers may be asked to make corrections. * The title font should be in bold 12pt. Times New Roman text. * The main body of text font should be in 10pt. Times New Roman. * Please limit to two A4 pages if including charts, diagrams or illustrations. * Set the margins to: top - 25mm; bottom - 25mm; left - 22mm; right - 22mm. * Write the affiliation below the researcher’s name. Number the affiliation if there is more than one and then write that number next to the researcher’s name. Ex.1 - For no collaborative researchers. Ex.2 - For collaborative researchers. ＊From the “Proceedings Template” link below, download the designated style instructions. Please follow them to create a document for the proceedings. ＊Please send to the email address below. At the 46th conference, added to the conventional presentation fields of humanities, natural sciences and instruction, there will also be an “International Session”. The “International Session” and the “Poster Presentation” will be conducted in English. Furthermore, the registration of abstracts (500 words) will also be in English. The other fields will require an abstract in Japanese (1000-2000 characters) with an English title and an English abstract (200 words). Applications will be completely online. ※Registration The presentation application period has now finished. ※The time limit for online application has been extended to May 17 (Fri), 2013. Publication of this journal is supported by the Nippon Budokan Foundation. COPY RIGHT(C)Japanese Academy of Budo.All Rights Reserved.